How To Strengthen Your Lower Back And Core | Get a Strong Lower Back & Core in 2 WEEKS! If you clicked on this article, I’m assuming you want to strengthen your lower back and core. Maybe you’re a mom and you’ve been through a pregnancy. I know how that takes a toll on your lower back and how your core muscles are not feeling how they used to feel. Or maybe you have non-specific lower back pain and it could be caused by your core muscles and lower back muscles being weak. In any case, I’m here to help! Because these muscles are not activating at the right time and in synergy with each other, doing regular ab exercises to strengthen your core can do more harm than good. That’s why I don’t advise doing regular crunches, sit ups and leg raises at this point. They will just pull more on your lower back without solving the activation problem in your core, possibly creating even more issues for you. Instead of those big, heavy exercises, you want to reactivate all these tiny muscles and improve the muscle synergy between them. When you strengthen your lower back and core, the muscles will work together. They will stabilize your lower back an core, and from there, only when you’ve come that far, you can start doing those heavier ab exercises again. But first things first. Let’s strengthen your lower back and core. 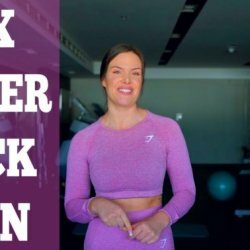 These are the three exercises I recommend you start doing to reactivate the deep core muscles, the tiny muscles along your spine and your pelvic floor. Repeat this program minimum three times per week and in just TWO WEEKS you’re going to feel a massive difference. Your core will be stronger and if you’re currently suffering from non-specific lower back pain, your pain will be gone before you know it! Exercise number one is a supine overhead reach. You want to keep your lower back flat on the floor and you do that by making a posterior tilt with your pelvis and activating your core slightly by pulling your belly button down towards the spine. Next, raise your arms straight up towards the ceiling. While keeping your lower back flat on the floor, slowly lower your hands down towards the floor over your head. If you feel your lower back lifting as your hands make their way to the floor, stop the movement, reactivate your core, exhale and return your hands back to the starting position. If you can keep your lower back on the floor, lower all the way down, gently touch the floor, and then exhale back to the starting position. Repeat 10 times in three sets. Exercise number two is a Glute Bridge with Lifted Toes to help you activate the posterior chain instead of your thighs. To begin the exercise, lie on your back with your knees bent and your feet flat on the floor. In this position, make a slight posterior tilt of your pelvis. Your lower back doesn’t have to be completely flat on the floor, but you want to have a little bit of a tilt to help you activate your core. Next, lift up your toes. Only your heels are on the floor. Lift your hips up as high as you can by squeezing your glutes and hamstrings and pressing down on the floor through the heels. On the top, hold the position for five seconds and really squeeze your glutes and abs. You will also feel your lower back working. After 5 seconds, slowly lower down to the starting position. Repeat 10 times in three sets. Exercise number three is the Superman to strengthen your posterior chain, especially your lower back. To begin the exercise, lie flat on your belly. Stretch your arms up over your head and let the thumbs point up towards the ceiling. Make sure to keep your elbows straight throughout the exercise. Next, inhale and lift up your chest, your thighs, elbows, hands, knees, and feet. Hold the position for five seconds, before slowly lowering back down again. Inhale when you lift up, hold your breath at the top and exhale on the way down. Repeat this exercise 10 times for three sets. If you came this far, thank you so much for reading this blog. If your aim is to strengthen your lower back and core, I hope you found it useful! If you have any questions, feel free to leave a comment and I’ll get back to you as soon as possible! If you know anyone who can benefit from this blog, feel free to share it with them. You can also go to my Instagram and YouTube for more free content like this. Many people with a weak core or lower back pain also have tight and weak hip flexors. If you tat’s you, I wrote this blog where I share my workout program to Stretch and Strengthen Tight and Weak Hip Flexors. For personalized training programs and nutrition coaching, click here. Gør det, smukke S! De er så gode til at styrke din core. Æææææv er ked af at du blev skuffet. Men så er det jo bare om at kigge forbi Dubai ;) Du er altid velkommen til at komme herned til sol og en lille træning, hihi.